Usually, people buy a lottery ticket in the hope of winning one day, fulfilling their dream. Once they have ‘beaten the odds’ and become millionaires, they enjoy their money usually using it for luxuries and to spoil themselves. This is the usual and accepted scenario. 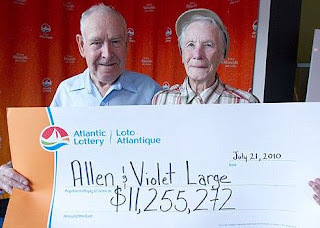 However, Canadian lottery winners Allen and Violet Large decided to take a different approach and give all their winnings, which came to total of 11,2 million US dollars, away to family, charities and hospitals. Why? One would ask - Read about their reasoning behind this, their extraordinary behaviour. “What you’ve never had, you never miss,” was Violets words when asked why they decided to give away their winnings. Violet and her husband Allen have been in a happy marriage for 36 years and simply believe that the money they won would not add any more happiness to their lives. According to them they were 'pretty well set, not millionaires, but comfortable,' and found that the lottery win caused them more of a headache than joy. Firstly the couple decided to help family members and thereafter donated some of their winnings to their favourite charities and organisations. Violet was undergoing cancer treatment at the time of their lottery win and hospitals in Truro and Halifax, Nova Scotia, were among the main beneficiaries of the Larges' generosity. They also helped their local fire department, churches and cemeteries, the Red Cross and the Salvation Army in their home town of Lower Truto, Nova Scotia. This generous couple have not revealed how much of their winnings they donated to each beneficiary, however each one of their beneficiaries were extremely grateful and appreciated. What Allen and Violet did is not something one finds often. It is very rare and an enormous act of generosity. According to Allen, “The money that we won was nothing. We have each other”.